When you and your family are staying at Camping La Chapelle you can enjoy a holiday where everything is within a short distance. This fantastic campsite is placed in beautiful surroundings only 200 meters from a lovely, sandy beach. Here you will have a great amount of facilities such as a nice pool area, many sport activities, two bars, childen playground, entertainment and much more. There is a charge for the bracelet to access the pool from 8/6-31/8 on Camping La Chapelle for customers who have booked an accommodation from our supplier Homair. Adults (13 years and above): € 15 for 7 days / € 21 for a fortnight / € 25 for 3 weeks Children (from 9 to 12 years): € 10 for 7 days / € 13 for a fortnight / € 16 for 3 weeks Free for those younger than 9 years of age. We know Camping La Chapelle! Camping La Chapelle is a very family-friendly campsite, which offers all the relaxing calm you could wish for. The beauiful surroundings and the many facilities give you the possibility to combine a relaxing holiday with funny activities and great enterntainment for both kids and adults. Why choose Camping La Chapelle? 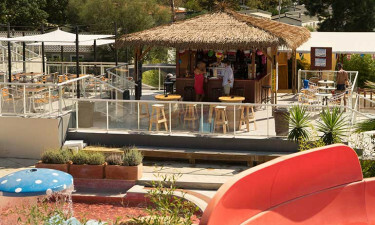 Camping La Chapelle welcomes you to a fantastic pool area with a covered and heated rectangular pool, a huge lagoon, a toddler pool with a mushroom fountain and three family pools, where two of them are a deep plunge pool and the last one has a separated area for small children. Furthermore, the pool area has two water slides where both children and adults will have fun. 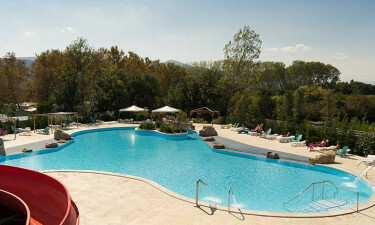 The swimming pools are surrounded by a beautiful sun terrace with sunloungers. Pool passes are required to enter the pool area, and parental supervision is required. 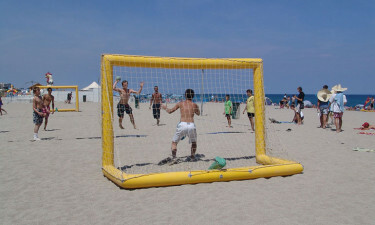 At Camping La Chapelle you have the possibility to play tennis, football, basketball, volleyball, boules, table tennis, and crazy golf. Furthermore, there is two children playground areas and one trampoline, where parential supervision is required. For the toddlers, there is a mini club and for the older children, there is a kids club which provides activities, games and workshops, and the children will without a doubt meet new friends here! The animation team will ensure great evening entertainment such as karaoke. Camping La Chapelle has a take-away restaurant where you can buy tasty meals for the family. Furthermore, you have two cosy bars on site which provides cold and refreshing drinks all day and night. The campsite is located within walking distance of Argeles-sur-Mer, where you can find great restaurants. If you prefer to cook your own meals, you can visit the mini market at the campsite that provides a great assortment of groceries. In addition to this, the campsite has a bakery from which you can buy freshly baked bread every day.